Ever since the very beginning of Merch by Amazon, doing the right research and making sure that you can gain search visibility for designs people ACTUALLY want to buy has been the differentiating factor between those who see success and those who don’t. As the Merch landscape has changed over the years, we have taken to expanding our research from just Amazon, to covering multiple platforms. If you can find niches where there is customer demand, there is social proof and people are active in that niche, and you can create something unique that will stand out, you will make sales. It really is as simple as that, but is so often overlooked. What we soon realized though was that Pinterest is a gold mine of ideas and niches that have not even made it to Amazon yet. Creativity in the print on demand space is just one of the edges you will have over your competition. If you can bring that creativity to niches that are popular that are NOT on Merch yet, you can make more money without running AMS ads or advertising in other ways because the buyers already exist, but the products don’t! 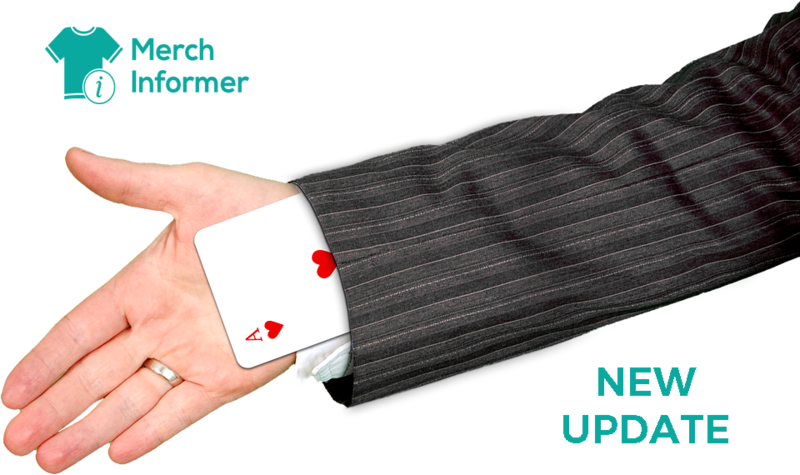 For this reason, we are happy to announce that we have added Pinterest Research to the Merch Informer software. This can be found under the Social Hunter module. Let’s go over how it works! First, log in to Merch Informer. If you do not have a Merch Informer account, you can grab a 3 day free trial here to check everything out: https://merchinformer.com/pricing/. 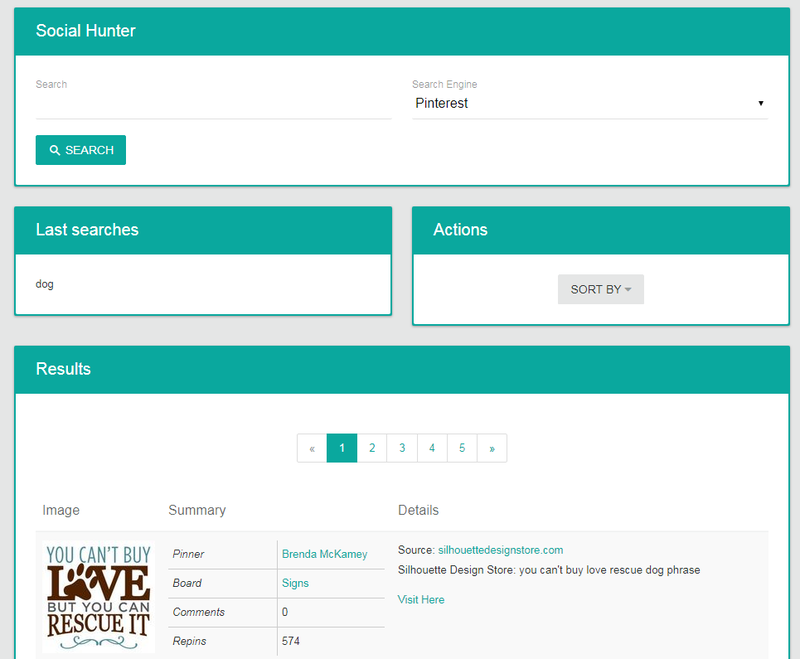 Navigate to the left hand side menu and click on the social hunter module. Once you get inside of the Social Hunter, you will notice that there is a search engine drop down. We have already added Etsy research to Merch Informer, so you will want to use the drop down to select Pinterest. Once you have selected Pinterest, just enter in a keyword and click on search. For this example, let’s use the keyword “dog” since this is a very popular overarching niche (not niched down). Once the search results come back, you will see a few things on the page. The first is that you searched Pinterest, you will see your last searches, and then you will see actions. If you are not familiar with Pinterest, let me quickly comment on what each of these things means. Pinner: This is a link to the profile or business that actually posted the image to Pinterest. This is helpful because you can click on their profile and take a look at what else they are doing. If they are in a niche that is underserved, you may be able to offer the target audience a much better product. You will want to use this for deeper research. Board: This is a specific section of Pinterest. These are just collection of pins. This could be a personal board where the pinner is pinning all of the things they like/sell, or it could be a group board. Group boards let multiple people contribute images and these tend to get lots of visibility from the members of the board. If you see something doing really well that was posted in a group board, you will want to click this link, join the board yourself, and post your own unique designs to get extra eyeballs. This is some of the best no cost marketing you can do! Comments: This is the amount of comments that the pin itself has. Not all pins will have comments or many at all, but this is social interaction. If people are interacting with a pin, then you know that people are at least interested in that niche that the pin is in. Repins: This is some of the best data that you can use for your business. The repins represent how many times that someone say the image on pinterest, liked it SO MUCH that they decided to pin it to one of their boards, and gave it even more visibility to the people that follow them. If a design has lots of repins, this is social proof that people like it, and that niche has money in it! We all know that the dog niche has so many designs it in that it can often be hard get a sale or get any visibility at all right? That is exactly why I picked that keyword to search! The Pinterest module will pull back results that are relevant to the keyword you entered. This means that they may not always be t-shirts, and this is good news for us. As you can see, this is a dog leash holder (with links to the Pinner, board, where they are selling it, and a link to the pin itself). This is not a piece of clothing at all, but that works out to our advantage. What I notice right away is that it has 72 repins. People that love their dogs liked this pin so much that 72 of them decided to pin it to their own boards on their page. Not bad! Proof that people are interested. The phrase on the leash holder is: “Did someone say “walk”?”. Only 5 results on Amazon! This is pretty much zero competition the way it is, but we want to make this unique so that we can start selling in one of the biggest niches on Amazon, without worry of any competition at all. To do this, let’s change the phrase slightly. 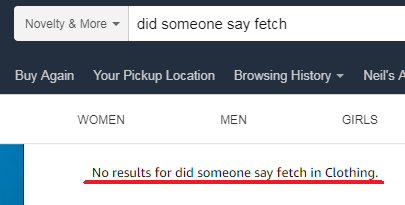 In about 10 more seconds, I realized that the phrase could be “Did someone say “fetch”?”. The design could be a custom illustrated dog, holding a tennis ball in his mouth, looking at his owner with that phrase above or below. This is not rocket science, so let’s go ahead and check that new phrase on Amazon. ZERO results for our new phrase on Amazon. The best part is, while this phrase has no results on Amazon, we know that people are actively interested in and are buying shirts in the overarching niche of “dogs”. To put a design up, you simply need to create something great, and use the keywords from the Merch Informer Product Search in order to get search visibility on your new design. Just using the example above, you can make use of the new Pinterest module inside of Merch Informer to do some deep dive research, but also quickly get into saturated niches. You CAN be the first one to a niche, even 3 years after the program has started. There are still opportunities everywhere, you just have to be willing to look for them. Pinterest is one of those places. We have been talking about Pinterest for years now on the Merch Informer blog for both research as well as marketing. If you can leverage this platform to its full extent, you will give yourself another edge over your competition! This is truly exciting I’m heading over there right now, but first did someone say coffee?